He slid the parchment from the scroll case, unwrapped it, and spoke the word written on the case. Rathgar looked over at the blank parchment as a simple line box appeared on it. "Great. It drew a box." He rolled his eyes. "Is this why we cleared out that nest of ghouls?" "Oh yes" his robed companion replied. "This parchment will keep us from becoming lost in any dungeon we explore from now on!" Crafted from water and fire resistant parchment, this magic item will accurately map any interior location that it is brought into. In order to activate the map it must be held, and the command word spoken. It will retain the map that it has drawn for as long as it is held, and for up to 12 hours after it is dropped or put away, starting with the locations it first mapped. If it is again held the map will retain whatever locations remain upon it, and the 12 hour clock is reset. The map can also be erased by speaking the command word in reverse. It is possible to make notes upon the map, but these will also be subject to erasure, no matter what was used to inscribe it onto the map. If the map is damaged it will cease to record any further locations, and will act as if it has been dropped, even when held, until it is repaired. In 4e terms, this is a level 3 wondrous magic item. Last night I put some more work into my megadungeon and I've decided that I'm going to use the back story from the How to Host a Dungeon to build it around. The dungeon under the castle is going to be but a small portion of the whole. The focus of the dungeon is in fact going to be the central shaft the dwarves dug down to mine the gold. I've decided that this shaft was dug during a true golden age where dwarven magic and technology was well advanced from the current state of things, and excavating a shaft that is 60+ feet in diameter and miles deep with a spiraling stone staircase going down the enter depth was impressive, but not impossible. It has become a well known feature, and many have delved into it's maw! Few, of course, have returned. Down the length of the shaft will be the entrances to the various levels of the dwarven halls, all the way down to the mines, and then even further down into the ruins of the dwarven city! There will probably be some monsters that live in the shaft itself, and there will probably be plenty of wandering monsters on it. I'm thinking the inhabitants of the various levels connected to the shaft wont try to defend the stairs near their lairs, but will have some pretty heavily defended doorways. In fact, the stairs may very well be considered neutral territory... I don't envision the stairs having a railing. 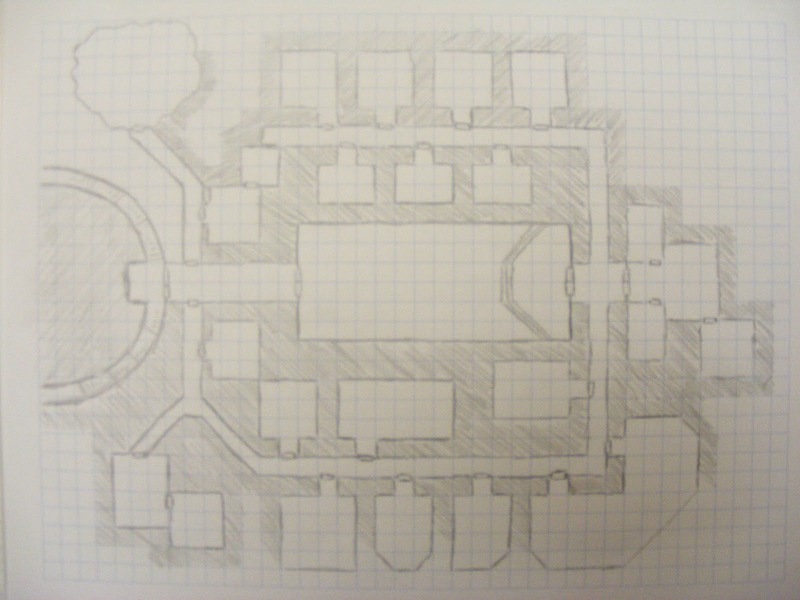 Last nights work focused on one of the upper dwarven halls near the surface. The shaft is shown to the far left of the image. The central hall would have been the dwarves main feast hall, perhaps for several levels. The room complex to the right would have been the lords residence. The room at the bottom right will be a workshop room. A forge & smelter? The rooms along the top of the map will all be domiciles for those living on this level. The irregularly shaped room to the top left I think might be a natural pocket that was used as a refuse room. I still need to add in stairs to a small vault level. I still wish I could map like Dyson. The man is inspiring!! "Old-wives tell of people who step into a ring of toadstools and are whisked into the dance of the fairy court for what seems a night, only to return many years later... if at all. Well, I'll tell you that I've stepped into many of those rings, and I've encountered not a single fey, red cap, or dandelion eating eladrin. But I have gotten some nice mushrooms for my stew pot!" Red concluded, ladling out another bowl. The patrons of the tavern nodded, some smiled, and others took a spoonful of the aforementioned stew. A young man who just recently started visiting the Toothless Rat turned toward Red and spoke with a smile "Perhaps they just found you too unpleasant to whisk away?" Most of the time rings of mushrooms are just that. However there is some truth to the old tales, though not many know the secret. Fay rings can be used as temporary portals to the Feywild, which can be opened from either side. The ritual to do so is a closely guarded secret held by many powerful lords and ladies of the fairy courts. It is very similar to that of a teleportation circle, but it can only be cast at a location where the fey ring exists in both realms. This ritual opens a portal between a fey ring in the physical realm or the Shadowfell and the corresponding ring in the Feywild. These naturally occurring rings may only be activated by those of elven blood, and when the proper ritual is performed, they open a 2-way portal to an outer plane ruled by the faerie. I've been experiencing some real life breakdowns. As I type my car is being looked at by the mechanics who will probably tell me I need a new alternator. In a purely defensive exercise I've been trying to think of how this sort of thing could impact a game. There aren't any alternators in D&D of course, but there are methods of transport that can break down. Ships can lose a mast, horses can throw a shoe, wagons (with loot!) can break a wheel. How does this slow down your group, how do they handle this? What if someone comes down with an intestinal bug, or eats some bad cheese? Something that healing magic wont handle, but is really only a relatively minor inconvenience. In 4ethis is the sort of event that can be handled with a skill challenge, and maybe a loss of a healing surge during the next encounter. In older D&D this is the sort of thing that could be role-played out. The thing about this sort of scene/encounter/challenge is that it forces you to make a choice. 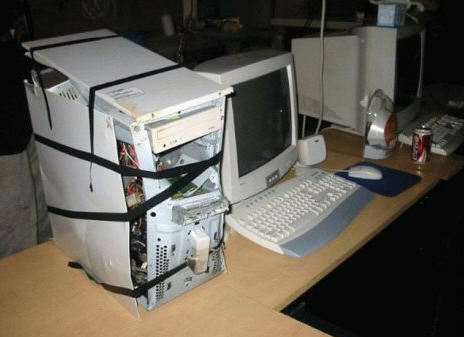 Do you slow down, stop, keep going, do you try to fix it yourself, or pay to have it fixed? Are people going to try to rip you off when you're in dire straights? I've heard back from the garage, and and it is the alternator, and now I'm spending $500 more than I was planning on. There are a number of different kobold miniatures out there, from Wizards of the Coast's prepaints, to ral-partha, reaper, kenzer, and a whole host of smaller companies, but none of them really thrill me. The WotC minis lack detail and definition, and just about everyone else goes for the more canine style. Me? I want kobolds that are truly draconic in appearance. While I could just go ahead and do counters, and there are some excellent ones out there, I really like having miniatures to hold and paint. One of the options I've been investigating is lizardmen. Not the Games Workshop army, but generic lizardmen. Too big? Sure, in 28mm scale. But what about 20mm, 15mm or even 10mm scale? There are some really nice figures being made in smaller scales that mounted on an appropriate base could fit the part. There are also some interesting looking ones on this site: Comparing Lizardmen. The pendrake lizardmen look pretty promising, and at least one guy, Rob, painted up some for his giant army. Anyone else out there ever try this? This past weekend the wife, dogs and I went camping. I brought along a whole box full of card games as well as my M20 binder and the 3.0 adventure The Sunless Citadel. It's a good adventure with a fantastic background, that is left completely untouched. The background states that the Gulthias Tree, which produces 2 fruits a year - a red apple that can cure at midsummer and a white apple that can kill at midwinter - was sprouted from a still-green stake used to kill a vampire in the depths of a sunken fortress. How fantastic is that for a story seed? Yet not even a mention of it in any of the offered character hooks. Also the village of Oakhurst is criminally under-developed. Anyway, what I had planned on doing was playing through Oakhurst with lots of role-playing, and then into the citadel, but I wasn't necessarily going to follow the dungeon map. Too complex for camping and not really what Virginia is looking for... at least not as written. We didn't end up playing D&D, though we did play a bunch of card games, but we did talk about it. We read through parts of the adventure together and she told me what she felt was wrong with it as presented. For instance comparing the map to the room descriptions, well, they just don't provide the info that a character needs. She suggested that having a copy of the map, so that she can say "I move to room 21" and I can then tell her what the flavor of the room is. I pointed out the problem of secret rooms, and she asked if the room was important. You know, it really wasn't. St. D'Arnson has a slightly smaller following than that of St. Gaxgy, but they are perhaps a more devoted group. When the Primordials began to form the world, and the gods intervened, an early being of light helped shape things on the microscale. Where the gods were concerned with shaping entire worlds, D'Arnson raised cliffs, drew rivers, and dug ravines, and when life was seeded on the worlds, his voice spoke to many in the early days of fighting back the chaos. In modern worship, St. D'Arnson is the patron of builders and storytellers, those who help to bring order to the chaos. This weekend I reread the D&D 3.0 adventure The Forge of Fury. I've run several of the original adventures that came out for 3.0, but I didn't run this one, and when I was looking at my shelf, I couldn't remember it at all. The basic idea is that a lost Dwarven tribe used to inhabit this dungeon and were wiped out, but the master smiths cache of treasure was never found. The adventure is split into several distinct sections, each of which is inhabited by a variety of monsters, from orcs, to troglodytes, to some undead, and a black dragon. The author does a fair job on back story and of explaining why these creatures are all cohabitating within the dungeon, but I have a few issues with the adventure as presented. First off, the adventurers are sent in after the dwarven smiths treasure. The treasure ends up being a bunch of coinage and a couple of seemingly random magic and masterwork weapons. I rather expected to have a chest of masterwork (or even magic) axes or hammers at the end. The thing that really bugged me was the black dragon who has moved into the underground lake isn't even hinted at in the beginning (except on the cover of the damn thing)! Really? A dragon has moved into the area and no one suspects a thing? I know the game is Dungeons and Dragons, but I still feel that a Dragon should inspire some awe and dread. It should not be stumbled upon randomly in an adventure without any buildup. Even worse it shouldn't ever be an actual random encounter! I also have an issue with the way many modules give away huge spoilers on the covers. This one is a prime example. The first adventure in the Witchfire trilogy is another. I had a group try to take out the antagonist the first time they met her, and when I asked why they said "cause she's on the cover hanging out with a bunch of undead and holding an evil looking sword." It's hard to argue with logic like that. Anyway, back to The Forge of Fury. It seems like a rather serviceable adventure, but I would totally rework the beginning to include some hint about the dragon, and the treasure... the whole adventure would need to be reworked in terms of treasure. I must admit I am tempted to rework it too. Not for 3.0, but for 4e. I think it would actually work out pretty well as a nearly straight conversion, with appropriate story rewrites. but if someone could try to leave a comment to check for me? It has never been a big part of my games, but I have always included Saint Gaxgy the Lawgiver in all of my games. In the pantheon he is usually a lesser god under whatever the main lawful good god happens to exist. On the surface his shrines are almost always attached to the main temples, and there are very few who venerate him primarily. Yet deep in the dungeons and caves of the world, where the forces of chaos (elemental or otherwise) threaten, all adventurers know his name, and many seek his blessing before they tackle their toughest challenges. Because of this, many shrines to St. Gaxgy can be found deep underground. Most of them are impromptu setups, but a few fully equipped shrines do exist, usually in the larger complexes. Shrines to St. Gaxgy give lawful characters a +1 bonus to their defenses and saving throws while they are within it. Any character, after visiting a shrine to St. Gaxgy may call out to St. Gaxgy for a +1 untyped bonus to any roll. Such a call must be spoken aloud by the player, and will only function once ever. 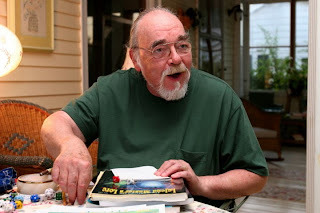 Examples of such pleas include "By Gygax's Beard!" 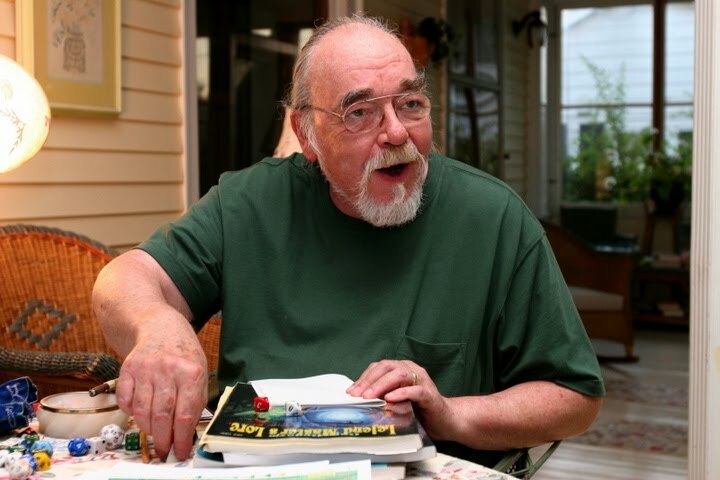 and "Gygax preserve us!" but a DM should encourage creativity in their players pleas.